At Legge Health Clinic, we have effective treatments which can help with this condition. If you would like to learn more, contact us. Thoracic Outlet Syndrome are a group of syndromes involving pressure on the brachial plexus. The fibres of the brachial plexus must pass through a narrow aperture between scalenes anterior and medius. Any increased tone in one of these muscles (usually anterior), will provide enough compression to produce symptoms. 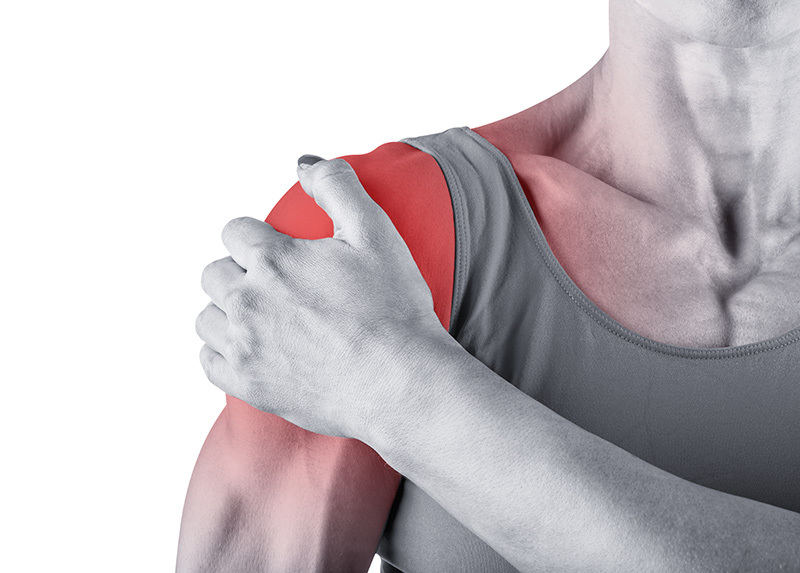 Scarring and adhesions from injuries (whiplash) or disease (rheumatoid arthritis) can be causes of compression, particularly if found at the attachments of the scalenes. Dysfunction or misalighnent of the cervical spine may also be a contributing factor to this syndrome. This is also called hyperabduction syndrome. At the shoulder, the posterior, lateral, and medial cords of the brachial plexus form a neurovascular bundle with the axillary artery. In this case, the compression here occurs where the neurovascular bundle passess between the tnedon of pectoralis minor and the coracoid process of the scapula. Tractioning is greatest with the arm in abduction, but even with the arm dependent, enough pressure from postural problems (hyperkyphosis) or tight pectoralis muscl4es can cause symptoms to occur. Symptoms result in this case when the neurovascular bundle is tractioned between the clavicle and the first rib. This is often bilateral, indicating a symmetrical postural cause. “Military” posture (chest out, shoulders back) can lead to the syndrome. See also stress reduction, trigger points, whiplash, torticollis, scoliosis, osteoarthrosis, degenerative disc disease and hyperkyphosis treatments for related concerns. Muscular hypertonicity from postural dysfunction such as hyperkyphosis, structural malalignments, trigger points, occupational stresses, emotion stresses, all of which lead to shallow breathing, and poor sleeping posture. Test the active free ranges of the cervical spine and upper limbs. Use PR ROM to assess for possible ligamentous or capsular restrictions in the cervical spine and upper limb. In all tests, a positive result is indicated if the pulse weakens or disappears, or if symptoms are reproduced during testing. Note that sometimes the pulse diminishes, but then returns. If the arm is not held up for long enough, it is possible to get a false positive. The client is seated for comfort and stability. Monitor the radial pulse at the wrist. Then ask the client to rotate and extend the head as far as is comfortable to same side as the therapist is monitoring. Instruct client to take a deep breath in and hold it for about 30 seconds. Proceed as for Adson’s. When monitoring the radial pulse on the symptomatic side, have the client turn head away from (not towards) this side. A positive test indicates greater involvement of scalenes medius. arm slowly into full abduction. It should be held in this position for up to one minute. In either a seated or standing position, ask the client to assume a so-called military posture: scapulae retracted and depressed, the chest pushed out. Now ask the client to take a deep breath and hild it for about 30 seconds. Monitor the radial pulse on one side first, then repeat the procedure for the other side. Using standard or hopedic tests, assess for lateral entrapment syndrome and facet joint irritation (Spurling’s Test), and cervical disc lesions (Kernig’s or Valsalva’s tests). If there are any doubts about the cause of the syndrome, make appropriate referrals to an M.D. This network of nerves extends from the neck to the axilla. The first structural segment of the plexus is the organization of nerves roots from C5 to T1 into trunks. Roots from C5-6 form the superior trunk. C7 makes up the middle trunk, and C8-T1 the inferior trunk. Each trunk then splits into an anterior and posterior division. In general, nerves originating from anterior divisions supply motor, sensory, and autonomic function to the anterior parts of the arm, while those from the posterior division supply the posterior arm. The second structural segment organizes the trunk divisions into cords. All three posterior divisions form the posterior cord. The anterior divisions of the superior and middle trunks make up the lateral cord. And finally, then anterior division of the inferior trunk forms the medial cord. It is from these cords that the individual nerves branch off. These terminal branches include the radial, ulnar, median, musculocutaneous and axillary nerves. In the neck and shoulder, the axillary artery finds itself anterior to the posterior cord and inbetween the lateral and medial cords. It is also subject to compression as the neuromuscular bundle, containing the axillary artery travels between the clavicle and first rib, then goes on the squeeze behind the endon of pectoralis minor on the coracoid process. The subclavian artery lies between the anterior and median scalenes, while the subclavian vein lies between the anterior scalene and the clavicles. There are three main scalene muscles: anterior, medius, and posterior. The brachplexus must pass between scalenes anterior and medius. Since scalenes anterior attaches onto the anterior tubercles of TVPs C3-6, and medius onto the posterior tubercles of TVPs C2-7, the resulting aperture is very narrow. Any cervical tractioning from postural or mechanical causes, or increased muscle tone will restrict the opening. This muscle originates on the anterolateral aspects of ribs 3-5 and attaches on the coracoid process of the scapula. The neurovascular bundle passes posteriorly to pectoralis minor. This muscle is located posterior to the clavicle and is continuous with the pectoral and cervical fascia. Trigger points present in the muscle can lead to fixation of the clavicle. The cords of the brachial plexus, together with the subclavian/axillary artery and vein, must pass through the narrow aperture between the clavicle and first rib. Some people have an eighth cervical rib attached to the last cervical vertebrae or an elongation of the transverse process of C7. It can be a small, still cartilaginous projection, or a fully formed bone. Confirmation of its presence is usually done by X-ray. If symptoms are severe, surgical excision may be indicated. Regardless of specific cause, all thoracic outlet syndromes feature paraesthesia in the arm, forearm, hand, and fingers. This numbness and tingling is often described by the client as “pins and needles” or the hand having “gone to sleep”. Symptoms are usually unilateral, but can be bilateral, partucularly if postural dysfunction is a main cause. The scalenes syndrome has some distinguishing features. A client with this syndrome is most likely to report symptoms along the ulnar border, sometimes pointing to the ring and little fingers as areas of greatest discomfort. Anterior scalene syndrome is also noted for edema in the hands and fingers, caused by impaired subclavian bloodflow at the first rib and clavicle level. Learn more at Mayo Clinic and Wikipedia. To provide the best possible therapy to patients utilizing Registered Massage Therapy, Chiropractic, Acupuncture, Naturopathic Medicine, Osteopathy, Low Level Laser Phototherapy, Functional Movement Exercises & Orthotics.